At L.I. Elite Lawncare, we pride ourselves in providing expert landscape design and professional customer service for residential and commercial lawn care on Long Island. We also serve you with high-quality products that will help beautify your Long Island home or business. Our weekly lawn maintenance customers have come to rely on the services we supply to beautify and enhance the curb appeal of their property, but we can also give you a little bit extra. Many of our Suffolk lawn maintenance customers also take part in our fertilizer program. Fertilizer can strengthen your lawn and give it solid protection against weed growth. Since every lawn is different, L.I. Elite Lawncare will customize your fertilizer program to your needs. We can also beautify your grounds and keep your plant material healthier with our mulch program. L.I. Elite Lawncare offers mulch in several varieties and colors and it’s sure to add character to the area around your plants as well as protect them. Sometimes you need a lawn to look terrific but can’t wait for seeds to grow. That’s why adding sod to your grounds can be a popular option. 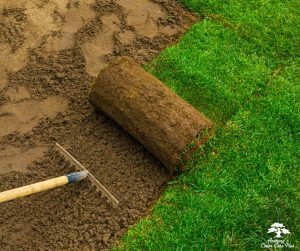 Adding sod can transform your grounds and enhance property value quickly if you’re selling a home. With proper maintenance, your newly sodded lawn will decrease the chance of future weed growth. L.I. Elite Lawncare also has trees available that will make your property stand out. If you want to give your home a tropical feel, why not install one of our palm trees? They will grow on Long Island in warm weather months and they’re perfect for waterfront homes and businesses or to place near your patio for entertaining. For those who desire privacy on their grounds, Leyland Cypress trees are ideal. They are sturdy, beautiful and they can help create a privacy barrier around your property. Also, Leyland Cypress Trees grow great on Long Island with a high survival rate. All of L.I. Elite Lawncare’s products are expertly installed and we’ll be happy to answer any questions for you. Contact L.I. Elite Lawncare and we’ll let you know how to make your property unique!